Apple's new Mac App Store will be instantly familiar to anyone who has used an iOS device, bringing the same look, feel, features and convenience to Mac OS X Snow Leopard. 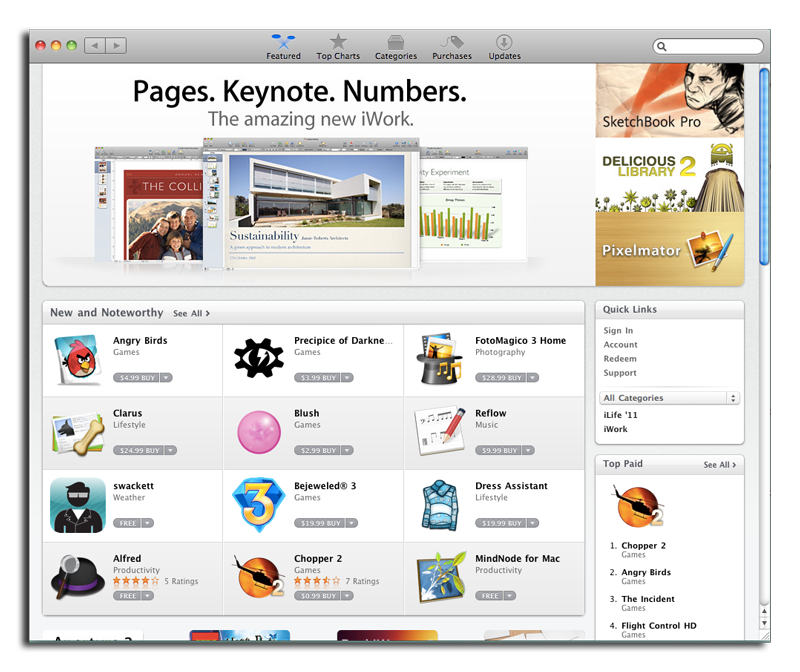 The Mac App Store was released Thursday morning as a part of the Mac OS X 10.6.6 update for Snow Leopard. Upon applying the update and restarting their Mac, users will find the App Store icon in their dock. The storefront looks and feels just like its iOS counterparts, with a "Featured" section that greets users when it is first launched. 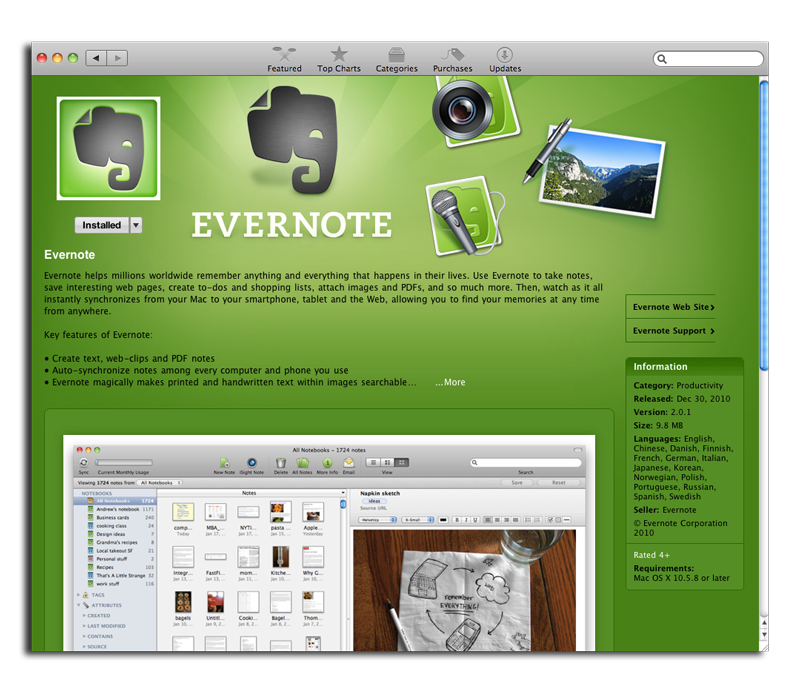 From here, a variety of software options in multiple categories are highlighted by Apple. The Mac App Store will be instantly familiar to iOS users, with essentially the same layout, including lists available for the top paid, free and grossing applications. 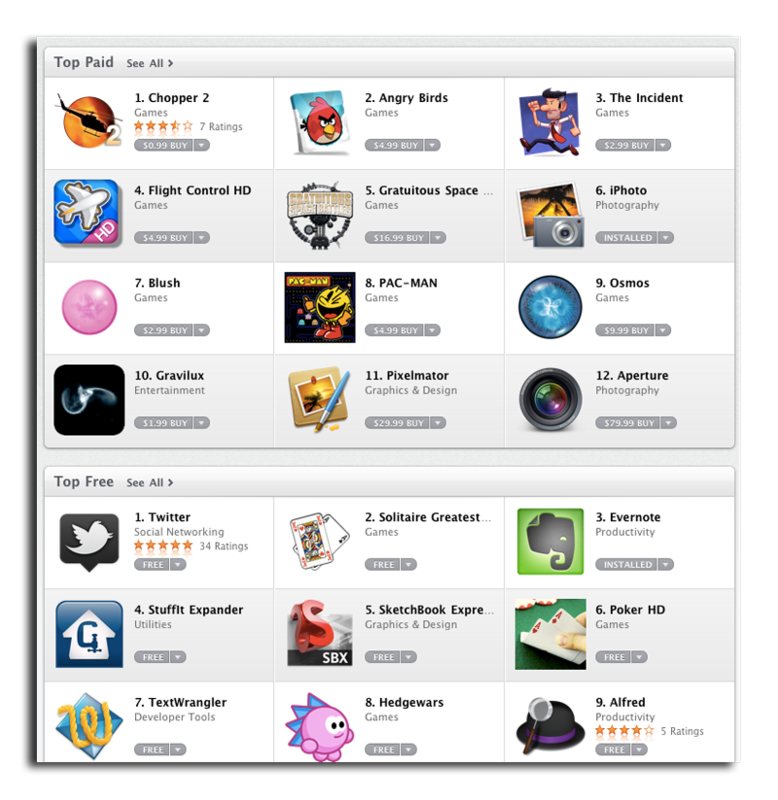 The same sections are presented with identical icons, like "Featured," "Top Charts" and "Updates," with one new option: "Purchases." And software is available in the same categories, including "Business," "Games," and "Music." The App Store serves as a place not only to find new software, but also to manage applications and be notified of updates. Some of Apple's own applications, like the iLife '11 suite, were immediately identified as already installed by the Mac App Store. But on at least one machine, the Work '09 suite of Pages, Numbers and Keynote displayed the option to buy for $19.99 each, even though they were already on the system. Also, strangely, Apple has highlighted its iWork suite in the Mac App Store, calling it "new," even though the only version available is iWork '09. Last November, AppleInsider reported that Apple has apparently completed development of iWork '11, but the company chose to hold off on releasing it until the Mac App Store opened for business. In addition, free third-party applications already installed from outside the new App Store are not recognized, but they can be reinstalled with the new storefront. Rather than leaving users two copies of the free software on their Mac, the App Store installation process simply reinstalls the application, but gives it the benefits of the App Store, including licensing associated with an Apple ID and notifications for updates. There is not currently a way to have the App Store recognize previously installed, paid third-party software, as this would leave Apple out of its 30 percent cut of all App Store sales. That means users who want the convenience of the App Store will need to buy the software again. Before users can download anything from the store, they must first agree to new iTunes terms and conditions, updated to reflect the availability of the Mac App Store. After a purchase is made and the download initiated, its icon shows up on the dock, and a progress bar is displayed below it on the dock. Here again, the installation process looks and feels much like installing software on an iOS device. Even the applications themselves will be familiar to iPhone, iPod touch and iPad users. Many of the same popular game titles have already come to Mac among the first thousand App Store options, including "Angry Birds," "Flight Control HD" and "The Incident." Like with iTunes, users can obtain a link to a specific application and share it with friends. But browsing the Mac App Store in its own application does seem strange, given that iOS App Store purchases can only be made on Mac OS X through iTunes, where users also manage and sync their iPhone and iPad. The release of the Mac App Store is Apple's first major step toward bringing features from the popular iOS to the Mac platform. Though the App Store is available for Snow Leopard through an update, it will be an integral part of Apple's next major operating system upgrade, Mac OS X 10.7 Lion, due out this summer. Apple gave a glimpse of Lion at a media event it held last October, noting that it would bring multi-touch gestures, App Home screens and full-screen apps from iOS to its desktop operating system. Also like iOS, applications will have the ability to automatically save, and to resume where they left off when they are relaunched.